← Who Are You Rooting For? In an earlier post (Who Are You Rooting For? ), I mentioned the Carlsen-Radjabov game from round 7, in which Radjabov missed a clear win with a bishop redirection from d6 to a5. There are lots of examples of improving such a poorly placed piece, but there were a couple that sprang to mind right away. I’m not saying I’d have seen …Bc7-a5 in advance, but I’d hope that having these in my head would have helped. Once again, I didn’t remember the details so well, although I knew it was a game with GM Joel Benjamin on the black side out of a King’s Indian. Unlike the above example, I don’t know where I saw this game, but with the name and ECO code restriction, along with the first square of the bishop’s journey, it was very simple to find. It’s from the 1990 US Championship, with Igor Ivanov as white. Benjamin played 14…Bd8!, activating the unchecked bishop in due course with …c6 and so on. This took a while because White put some mild pressure on d6, but after 14…Bd8! 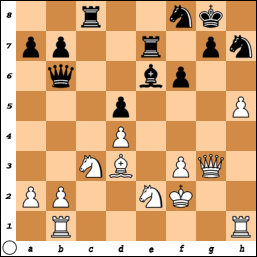 15.Qe2 c6 16.Rd1 Bc7 17.h4 Qe7 18.g3 Kg7 19.Nf3 a4 20.h5 Ba5, the bishop finally started to exert its influence. 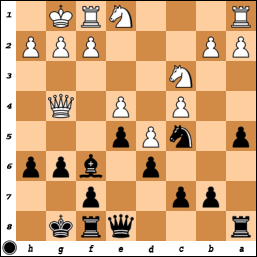 It ended up on b6 and the pressure on f2 along with central support for a moving pawn center (it took a while!) decided the game. This entry was posted in Candidates 2013 and tagged Benjamin, chess, Dvoretsky, Knaak, Makogonov, Radjabov, Yusupov. Bookmark the permalink. Sorry, this isn’t in response to Makogonov’s Rule…This is an inquiry. Hello Vinay Bhat, I found no other way to contact you, so I apoligze for using this medium. (Looked up a list of Grandmasters on Wiki). I am a writer based in South Texas and I am collaborating with a filmmaker here in creating a graphic novel. I need help developing a chess game scene/sequence. Was wondering if you would be interesested in helping us out. You would definitely receive credit for your part in the project. It should not require a lot of time. And I read that you had lived in Campbell. I lived there before I moved to Texas…off of Winchester. If you’re interested, I believe you now have my e-mail address. Thanks for your time. I found this post by putting the FEN into Google. I was trying to work out why my chess engine was scoffing at Bc2 and thought I must have something wrong about the position. Ha! You found the same.